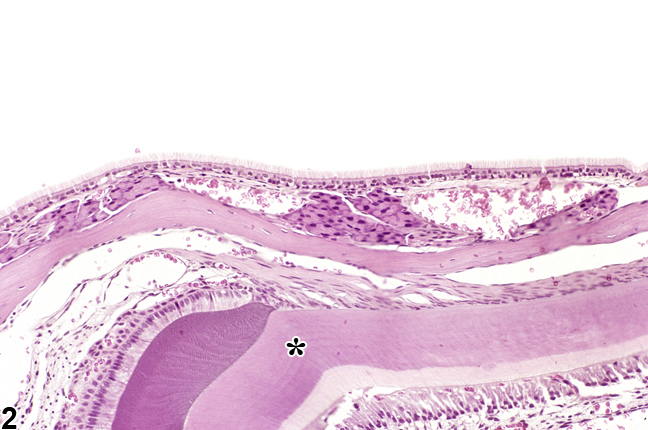 Nose, Transitional epithelium - Fibrosis in a female B6C3F1/N mouse from a chronic study. 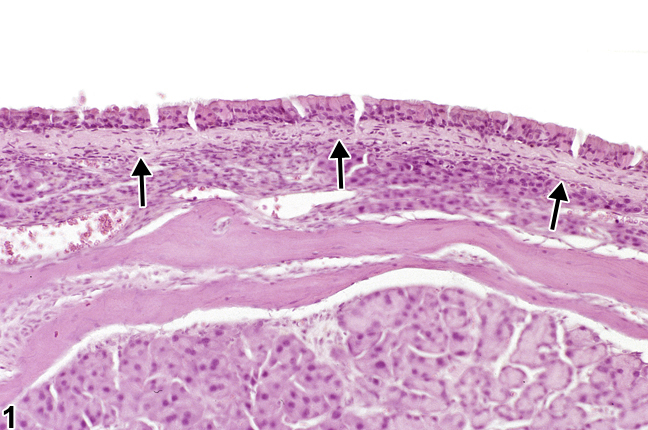 Eosinophilic fibrillar material expands the lamina propria, separating the epithelium from the glands in the lamina propria. Nose, Transitional epithelium - Normal in a male B6C3F1/N mouse from a chronic study. This normal lateral wall in the nose is presented for comparison with Figure 2. A tooth (asterisk) is visible in the section. Fibrosis appears microscopically as an increase in the amount of fibrous connective tissue that either replaces or expands normal structures. Because it is often a response to severe tissue damage, fibrosis is often associated with inflammation and/or necrosis. 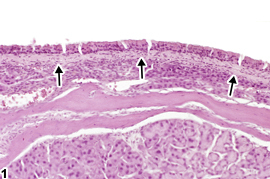 Fibrosis in the lamina propria of the nose ( Figure 1 ; compare with control shown in Figure 2 ) is uncommon. Fibrosis is an uncommon lesion in the nasal cavity and should be diagnosed and assigned a severity grade whenever it is observed. As with inflammation, the epithelial cell type associated with the fibrosis should be recorded as a site modifier. Other lesions, such as the inflammation and hyperplasia noted above, should be diagnosed separately.